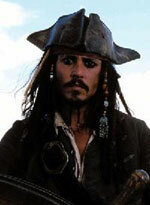 I probably don't need to tell you how much I loved Pirates of the Caribbean: The Curse of the Black Pearl, the swashbuckling summer smash hit that proved pure shiny gold at the box office and catapulted a certain Mr Johnny Depp from the lower decks of the A list to the crows nest at the top. So needless to say I've been counting the days until the inevitable follow up hit our screens - not, I might add, without some trepidation. 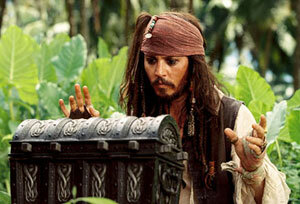 Would Dead Man's Chest be full of treasure, or a bit of a Pandora's box? First of all, let me say that I enjoyed every minute (all - gads - 150 plus of them) of Dead Man's Chest. Like its predecessor, it's sparky, funny, exciting, visually awesome, big beamy grin entertaining and, of course, it's got Johnny playing Captain Jack Sparrow in it, and I'd pay to watch him read out the phone book in his ludicrous, punch drunk, Keith Richards-esque drawl (although I still reckon the original 21st century gypsy pirate Tyla must be an unacknowledged influence). But - and you knew there was a but on the way, didn't you, just as, in Dead Man's Chest, you know every time you spot a hole that Jack is going to fall into it - it's not quite as good. This is partly due to the fact that is lacks the element of surprise of Curse of the Black Pearl. Who, after all, imagined that a film based on a Disney theme park ride would be any good? Face it, we were just in it for the totty, and the fact that it was actually a cracking movie was an added and thoroughly unexpected bonus. And then there's the problem that it is the second instalment of a trilogy (so don't expect a satisfactory ending, by the way) which means there's a certain preliminary stage setting to be done for the final showdown to come in Pirates of the Caribbean: At World's End (or whatever it ends up being called). So while it isn't Back to the Future 2 (thankfully - anyone else feel utterly cheated by that self-indulgent pile of silliness? ), it ain't The Empire Strikes Back either - although, like the second (okay, fifth, whatever) chapter in the Star Wars story, it's definitely a lot darker and more gory than what came before. A lot of people die in Dead Man's Chest, and not in terribly pleasant ways. Put it this way, Mackenzie Crook's comedy pirate Ragetti isn't the only person whose eyes pop out. As for the plot - I'd say don't get me started, but I'm not sure I'd know where to begin. Um. the Dead Man's Chest in question belongs to Davy Jones (Bill Nighy with an octopus stuck to his face and, for some strange reason, a Scottish accent - surely, if anything, with a surname like that, Davy Jones should be Welsh?). Everyone wants the chest. Half the cast ends up on a cannibal island, for no apparent reason other than the fact that it's funny - unless you're from a small island and object to offensive racial stereotypes, that is. There's a scary voodoo witch queen in a swamp. 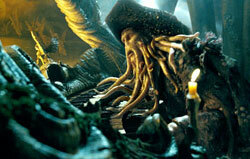 Davy Jones plays the organ, Phantom of the Opera style, with his squid beard, while his barnacle-encrusted henchmen play dice and try their best to look like superior extras from Dagon. There's a big scary squid monster in the sea. There are lots and lots of characters and it all gets a wee bit confusing. Do you care? No, because there's Captain Jack, and what more could you want? Still my ideal man - although, slightly disappointingly, he isn't quite as rock'n'roll as he was last time round. Clearly all those bottles of rum have started to take their toll, transforming him from sozzled high seas anti-hero into a camp, cartoony, walking (make that 'reeling') disaster zone. Someone evidently discovered that Johnny's very good at pratfalls, so poor Jack ends up flat on his face every ten minutes. It's funny the first twelve or thirteen times, but after that, you kinda start to feel sorry for the guy. 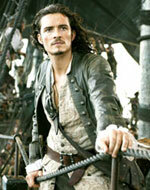 Orlando Bloom, bless him, is outshone yet again as lovable, wholesome hero Will Turner (but, in one of the film's many amusing nods to its swashbuckling ancestors, he does get to slide down a sail using a knife), busy with his selfless acts of derring-do while Jack ponces about getting all the laughs. Jack Davenport's disgraced Commodore Norrington, however, gets to have much more fun this time round, exiled from the navy and sliding into a life of rum and piracy (the 'campaign look' suits him, incidentally), while his role as stuck up English pirate hunter is usurped by The Libertine's Tom Hollander, whose baby-faced looks belie a steely determination to rid the seas of piracy. Keira Knightley, on the other hand, gets to snog Johnny, in an interesting subplot which sees our feisty heroine swither between her clean cut, upright fiancé Will and the swaggering, irresistible and utterly untrustworthy Captain Jack. Her desire to be free from the restraints of her corseted, 18th century good girl background is a nice idea but, thin as a stick and sporting a St Tropez tan and hair extensions, she's more Posh Spice than Moll Flanders.